Vang Vieng is one of the most popular tourist destination on the South East Asia trail due to its wide varity of out door activities and places of interest. Known worldwide for Tubing down the Nam Song River (Despite recent media reports the river is still open and thriving, and with new safety regulations put in place from local Government most people agree it's been made safer and a more enjoyable day out) Current prices - 55,000 Kip + 60,000 Kip deposit (updated 28/4/2013). Full deposit returned when you arrive back before 6pm. Price also includes your tuk tuk from the tubing office to the start of tubing. We recommended you start aprox 12pm. 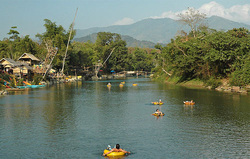 Life jackets are available free and dry bags are easily available throughout Vang Vieng. 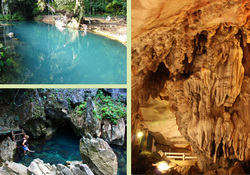 7km from the town centre, lies the Blue Lagoon and Tham Poukham Cave. The large cave is situated behind the Lagoon and boasts spectacular limestone rock formations, nestled among these is an ancient Reclining Buddha statue revered by the locals. After exploring the cave the Lagoon is the perfect way for cooling down in it's crystal waters and enjoying a cold beverage from one of the small cafes. Hot Air Ballooning - What better way to view these amazing karst limestone mountains Vang Vieng have to offer than hot air ballooning. The company boast the price of $80/person is the cheapest you can go ballooning anywhere in the world! Only available in dry season. Booking available from most guesthouses or tour companys. Flights only available for sunrise or sunset. From chilled out days kayaking down the the river, hanging out by Vansana swimming pool sipping on a cocktail to extreme days out like taking out dune buggys or quad bikes exploring this amazing town Vang Vieng has it all. 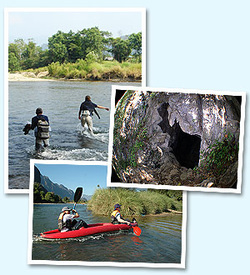 Caving - Explore yourself, lots to check out through the town or organize with a tour company to go tubing through a water cave.